Mosaics: A Collection of Independent Women will inspire and shock you with its multi-faceted look at the history and culture surrounding femininity. If gender is a construct, this anthology is the house it built. Look through its many rooms, some bright and airy, some terrifying– with monsters lurking in the shadows. 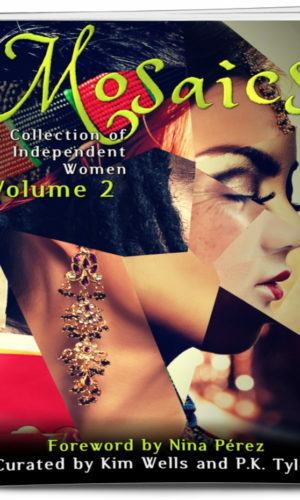 Mosaics Volume Two features twenty-two self-identified female authors writing about Intersectionality, including women of color, disabled, trans, and GLB/GSD* (Gender and Sexual Diversities). We have curated amazing short fiction, flash fiction, poetry, essays, and art. It’s personal, political, and a great read. Volumes 1& 2 of this collection include Hugo Award Nominees, Tiptree Shortlists, Pushcart Prize Winners, USA Today Bestsellers, indie superstars and traditionally published talents alike. The anthology combines leading and new voices all proclaiming their identity as Women, and their ability to Roar. Profits donated to the Pixel Project to end Violence Against Women. This feminist anthology is unusual in that it’s a mix of stories, poems and essays. The fiction is every genre from literary to speculative to magical realism. The tone also changes from piece to piece – some are hopeful and positive, others contain dark matter. This anthology is for dipping into rather than reading through at one go. I found them all worthwhile – whether they’re fun or force reflection. The darkest, perhaps, was Cookies by Catherine Schaff-Stump, a fictionalized but reality-based account of adult offspring of a terribly abusive childhood. (This story is particularly appropriate give the charity this anthology benefits. Kudos to the author for having the guts to put it out there, and to the Editors for getting it for this anthology.) The Mermaid Tale, on the other hand, is a triumphant tale of a woman sea-heroine, who lives the life she wants and wins her love, and The Lion and the Dragonslayer is another adventure story with a happy ending. I appreciated the essay on blindness, which really made me – as a sighted person – understand there are nuances I’d never even considered.